Justice work can happen in the halls of Congress and it can happen on the streets. This past Tuesday we did justice work in both places. We had been in Washington D.C. participating in the Religious Action Center’s Consultation on Conscience; Tuesday was our lobby day. As we were hearing from prominent Senators and Representatives at the Dirksen Senate Office Building, two blocks away at the Supreme Court, our Justices were hearing arguments on Marriage Equality, perhaps the most important civil rights case of this generation. 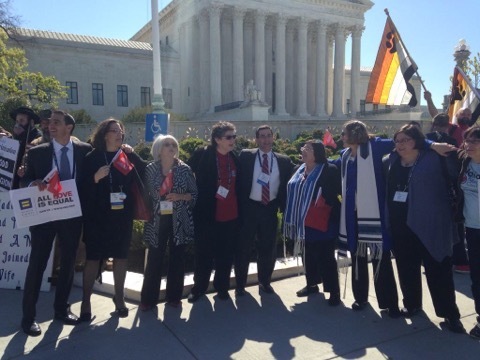 Rabbi Denise Eger, a leading advocate for Marriage Equality and President of the Central Conference of American Rabbis, and Rabbi Lucy Dinner were speaking at a rally on the steps of the Supreme Court and we wanted to go hear them. Although we missed their speeches, we might not have heard them anyway over the cacophony of competing rallies from both the Marriage Equality advocates and those who oppose equal rights for all (and whose signs and banners were particularly hateful). We didn’t plan this counter protest. But we were compelled to respond by demonstrating the powerful truth of our tradition. We knew we couldn’t stand idly by while a group of intolerant, hateful Jews tried to coopt out faith and our tradition. All it took were the familiar melodies of Hinei Mah Tov and Oseh Shalom to lift the spirit and the soul, to draw in other Jews, and those who aren’t Jewish and show how a heritage rooted in love and acceptance could overcome hate and intolerance. Eventually we returned to the Senate Building; we met with our elected officials and lobbied on issues important to us as Reform Jews. However our true prayer and passion on Tuesday was firmly rooted in street justice through our steps and our songs. Rabbis Mona Alfi (Congregation B’nai Israel in Sacramento, CA), Charles Briskin (Temple Beth El in San Pedro, CA)and Joel Thal Simonds (University Synagogue in Los Angeles, CA) wrote this piece together. They are members of Reform CA and representatives of the CCAR on the Joint Commission on Social Action. Not every opposition to Gay Marriage is hateful. Or is that what you feel? What made what you saw hateful?